Hardware infrastructure consolidation on SAP HANA: What's possible? SAP's announcement that it will use its SAP Fiori applications as a framework for user interface development could be a major step in the company's efforts to modernize user interfaces across wide swaths of its portfolio, according to one expert. "[SAP is] looking to standardize all their user interfaces on Fiori and have the same presentation layer across the entire [Business] Suite, and the cloud platform, talent management [etc. ], which is just massively, hugely exciting," said Chris Kernaghan, a senior SAP technical architect at Capgemini, the global consulting, technology and outsourcing firm. In May, SAP announced SAP Fiori, a collection of 25 apps designed for use on a range of platforms, from desktops to mobile devices such as smartphones and tablets, and addressing a variety of business functions, such as workflow approvals and self-service tasks. The apps were designed to be simple and straightforward, according to SAP. At last week's SAP TechEd conference in Las Vegas, the company announced SAP Fiori would be the new go-to UI framework to be layered on top of its applications, including ERP, CRM, SCM and talent management software. As part of the new push, SAP said it was also launching UI design services to help customers build new UIs for any SAP application, based on the SAP Fiori model. In this video, Kernaghan outlines why SAP Fiori is important for users, how it fits into the broader SAP technology framework that includes SAP HANA, and remaining questions about the Fiori roadmap. Figure 1: SAP's current technology framework, as diagrammed by SAP's Vishal Sikka during the 2013 TechEd keynote speech, and referenced in the above video. Sikka heads SAP's development efforts. All right. So we're here at another SAP Tech Ed here in Las Vegas, here with Chris Kernaghan. Did I pronounce that right? Good. Excellent. Chris is a consultant with Capgemini and an SAP Mentor. And why don't you tell us a little bit about what your area of focus is? Kernaghan: So, I have a broad focus across SAP technology. A [inaudible 0:00:26] consultant, specializing in infrastructure; so, upgrades, unit conversions, migrations, Infrastructure-as-a Service, Platform-as-a-Service. But I have a general love of technology, so I tend to cover an awful lot of areas. So I've been doing it for 12 years now. All right. So, let's get into it. So, this morning, in his keynote speech, Vishal Sikka kind of laid out sort of the SAP technology framework as he sees it. Including HANA and SAP Fiori and sort of some of these different components. Can you give us a high-level interpretation, or look, at what he was telling us this morning? Kernaghan: Okay. Yeah, the diagram that he drew on the tablet thing, it showed how the Business Suite and the cloud platform and the HANA and the Fiori actually sit. So, SAP are, from the looks of that diagram, looking to standardize all their user interfaces on Fiori, and have the same presentation layer across the entire Suite. And the cloud platform and the talent management, which is just massively exciting. It does raise some questions around SAP, mobility platform and some of the other technologies that they've employed at SAP, and that we have a business plan. So it'll be interesting to see what comes out from those. I know they released a SAP version three, which has been incorporated into Fiori, looking to feel it out. So that looks to be exciting. Then, when he drew, that was the top layer, then the underlying layer, which was HANA and the database and the applications platform, it's really never changed HANA across the entire suite on all the applications, television. He announced today that business suite is now supporting scale out on HANA SPS 7. What do you mean by that, scale out? Kernaghan: Previously, with BW scale out systems, so you get custom multiple nodes. The problem with the Business Suite was the fact that the tables and where they were buffered and the particular appliance. So they find it very difficult [inaudible 0:02:49] to ... you have to keep the data close to where you were querying it. Kernaghan: So, you have to keep joined within the queries, close together, not across multiple nodes, [inaudible 0:03:01] performance. So, they've obviously resolved that issue in SPS 7, so we know we have to scale out across the Business Suite. I don't have a massive amount of detail about it, but I know that that was something they had a challenge with. And then, we have the cloud platform, which was to extend those applications into by more extensibility, and do more exciting things. 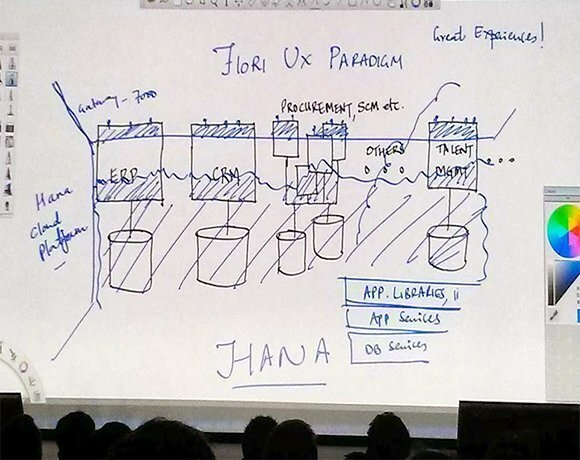 And when SAP Fiori kind of started out as a bunch of mobile apps, but now SAP Fiori is kind of their user experience, and kind of framework for all applications? Kernaghan: It seems that way. The Fiori version 2 is being worked on at the moment in Walldorf, and in various other places. And definitely the Fiori apps are gaining a lot of traction with a lot of customers, so, a lot a lot of interest. I know of one customer we're working with, the utilities company in the United Kingdom, we are looking to the Fiori apps for their CRM application, which is really exciting. So, it's interesting to see how that technology is now being spread across the entire staff, all the SAP technology. Okay. So tell me what has this company been working toward. What makes it so, why are they so interested in Fiori? Kernaghan: It's a framework for user interfaces. It's a way for them to make the user experience more pleasurable, really. Their user population is massively diverse, they have field engineers, they have call center works, they have back office staff, and potentially they can have customers interact with their SAP systems directly. So, Fiori gives them this rapid application development platform and these packaged as well that enable them to have a seamless user experience. So Fiori is both the framework as well as a set of prepackaged applications. Is that a good way to put it? Kernaghan: I'm going to struggle with that one. D.J. Adams is absolutely the guy that would be the person to put that too, but as I understand it, yes. That's the way I see it.